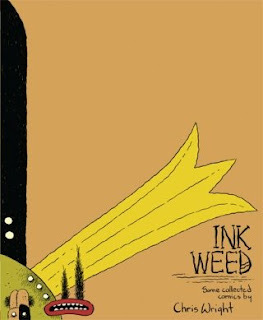 Published in 2008 by Sparkplug Comics, Inkweed is the first collected volume of Chris Wright's comics. Weighing in at a healthy 150 pages, the book contains nine short stories, all produced between 2002 and 2007. 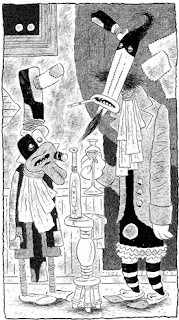 Inkweed is the first I'd seen of Wright's work and I couldn't help but come away deeply impressed by the sheer depth and expressiveness of his comics. Wright’s densely crosshatched pages bristle with life and intensity. There's a wonderful energy to his art, which manages to strike the perfect balance between simple fluid penmanship and prickly claustrophobic textures. 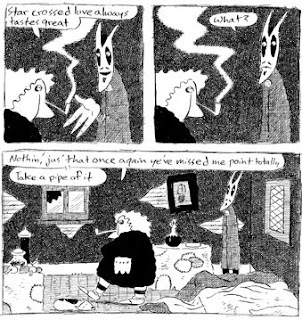 His characters are also an utter joy to behold, boasting a bizarre almost bestial quality to their construction; stitched together like living patchwork quilts, one step removed from Frankenstein’s laboratory, replete with unruly tufts of facial hair, strange augmented features and outlandish bodily protrusions. Making good on Inkweed’s immediate visual promise, Wright displays a similar knack for weaving haunting multi-layered stories, laced with gothic overtones and visual symbolism. Opener, 'The Unmerciful Gift' is a case in point and relates the story of Simon Cletus, an aging artist on the brink of unveiling his latest collection of paintings to an expectant art community. Following a protracted absence from the art world, Simon has little more to show than a collection of blank canvases. However, it soon transpires there's more to Simon's latest artistic venture than first meet the eye. "Have I dealt with the devil? ", Simon asks his wife, starting at a blank canvas. "Did my night brother commission him?" "What has he dropped in my ear?" "Whatever alchemy it's inspired has given me my hearts desire... under the most terrible circumstances". And so the tale begins to unfold, teasing out the mysteries of Simon's 'paintings' as it progresses. On the surface of things, 'The Unmerciful Gift' would appear to deal with the difficulty of expressing genuine emotion in art, particularly when pandering to the whims of the general public. Simon’s artistic vision seems to extend beyond the grasp of his audience, who instantly set about creating elaborate theories to explain the apparent lack of content. When, in a fit of rage, Simon attempts to make himself understood, we learn that his intent cannot be rendered in paint, nor can it be perceived by his peers, for his is a vision of terrible sadness, loss and despair. Much like Simon’s paintings, there’s far more to Wright’s narrative you might expect, and with each subsequent examination of "The Unmerciful Gift" I came away with a slightly different interpretation. Whilst it’s entirely possible I may have been reading too much between the lines, I found it to be an extremely dense piece of work, stuffed full of subtle visual pointers and prophetic symbolism. Like H.P Lovecraft and Arthur Machen before him, Wright draws on elements of the supernatural, imbuing his story with the same sense of eerie otherworldliness. During my reading of ‘The Unmerciful Gift’ I entertained many theories, including the notion that Simon had perhaps entered into some sort of Faustian pact, bartering away his creative spark in exchange for his deepest darkest desires. I also wondered at the significance of Simon’s wife Maude, who is frequently set against empty picture frames. Perhaps Wright’s protagonist, who experiences terrifying visions at the conclusion of the story, has glimpsed too much of the world beyond the veil. An experience he is clearly at pains to communicate to his fawning audience of fellow artists and well to do friends. Whatever Wright’s ultimate intention, this is a wonderfully well crafted comic, one which will no doubt stand up to numerous re-readings. The remainder of Inkweed proves to be equally engrossing, offering up a superb selection of short stories. Wright charts the dark depths of unrequited love, lust and human folly. His protagonists range from doddering old intellectuals to vengeful gods, all of whom must eventually face their own personal demons. Whilst the tone is generally one of somber intrigue, Wright does find room for the occasional spot of humor, which helps to prevents things from becoming altogether too maudlin. Suffice to say, Wright’s work is both visually captivating and intellectually beguiling, and taken as a whole, this collection of comics makes for an incredibly rich exploration of his chosen themes. Inkweed has all the makings of a future classic and deserves to be read by a wide audience. If this sounds like your cup of tea, do head on over to Sparkplug Comics and grab yourself a copy. nice review! Inkweed is one of my favorite books of '08... or any year for that matter. Couldn't agree more. I spent quite some time wrangling with this one! Quite hard to translate Chris' overall aesthetic into words! Great review...you get at the heart of the ineffable quality of Wright's best stories. There's always a sense of ambiguity there. I would have liked to have seen you grapple with "The Urn", which I thought was the most powerful and disturbing story in the book. Great blog, by the way! Looking forward to more thoughts on Sparkplug. Are you going to be writing about Asthma? Thanks so much for the feedback. I wasn't sent Asthma but will look at getting hold of a copy. Thanks for the heads up.